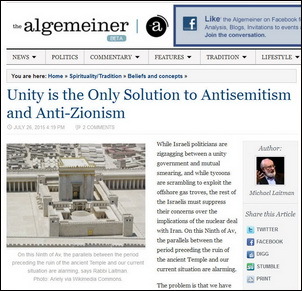 The American-Jewish newspaper, Algemeiner published my article, “Unity is the Only Solution to Anti-Semitism and Anti-Zionism,” which appeared for the occasion of Tisha B’Av (the 9th of Av). Question: Why are the customs of the Jews so different from those of other peoples? Answer: The reason is in the attitude, the meaning of existence. With the Jews it is the discovery of the Creator, the upper world, eternal movement. And from here is derived the amazing difference in burial. With all the peoples the person continues his earthly existence after death, so together with him are sent all kinds of things from his earthly life to the world after death: tools, clothes, money, jewelry, servants and so forth. With the Jews burial is simple, only simple white clothes, the same for everyone, for the poor and for the rich. The person doesn’t take anything with him except the deeds that he did. This shows the attitude in Judaism towards life and death, and from here also are the reasons for differences in the rest of the customs. This is because the Jewish people were created and appeared for spiritual reasons, motives, and goals; they were created artificially, taking upon themselves an “unearthly” law of love of others. The rest of the peoples were created and appeared naturally, from families, tribes, with their natural egoistic development. Babylonians who rejected Abraham’s methodology spread around the earth, to all countries. Abraham’s group left Babylon and went to the land of Canaan. Then, they descended to Egypt and then again returned to Canaan, which later became the land of Israel. Abraham’s group underwent numerous troubles. The main mission of the group was to transfer the methodology of connection when the time comes to the Babylonians, i.e., to the entire world. They had to unite at a higher level to reach a “mountain of hatred,” Mount Sinai, instead of the Tower of Babel. For that, they had to refer to a much more powerful force. Should they succeed, the methodology named “the Torah” would be disclosed to them. The Torah is the wisdom of Kabbalah that pursues the Creator’s revelation to the creations in this world. The Torah discloses the connecting network that unites us with each other through benevolent relationships, warmth, and mutual affection. The main principle of the Torah, “love thy neighbor as thyself,” should lead us from loving the created beings to loving the Creator. Moses disclosed the methodology to the people of Israel who went through Egyptian exile and gained tremendous egoism from being in the exile. Their selfishness reached a much higher degree than of those who were associated with the Tower of Babel. The Tower of Babel plus egoism accrued in Egypt transformed to Mount Sinai (hatred), thus they got a chance to work on Mount Sinai by improving connections between them. After revealing the enormous system of nature, the people of Israel realized that their mission was to correct the reality and humanity including the Babylonians from whom they once ran away. After this phase, the people of Israel reach a state of such a great unity that building the type of connection called “the Temple” becomes possible. The Temple stands for the vessel of sanctity for the sake of bestowal and mutual love. The vessel is called The Temple (the house of sanctity); divinity is bestowal and love. However, the people were unable to maintain a level this high for more than one instant; they immediately fell from this level. The great love and unity they attained for one short moment collapsed. People split into hostile groups that confronted each other. They continued to fall even lower until Nebuchadnezzar destroyed the Temple. This is not about ruining some building in Jerusalem; rather, it was about hostile egoistic forces that smashed unity among the people of Israel. They reached a wonderful state of unity. Inside it they revealed the system of the higher governance that rules the entire universe. All of a sudden, the beautiful rounded structure started rotting, deteriorating and exploding. Big groups detached from the people of Israel: the Sadducees (Tzdokim), K’tzinim (nobility), and others. As a result, unity collapsed. The Jews became strangers to each other as if they were already spread among other nations, as it is written in Megillat Esther. However, they remembered that they were united at some point in the history, but this fact vanished and wasn’t important to them anymore. The situation worsened. Historic process, i.e., the system of the upper governance they were previously familiar with, didn’t let them stay at the same stage forever. The first man Adam, together with Kabbalists who followed him, discovered that the world has to reach unity again. It is written in the Prophets: “Everybody will know Me; My house will become the House of Prayer for all nations. Everybody will unite. The wolf shall dwell with the lamb.” The world should attain unity and harmony that includes all these states. This level is called the Third Temple. “If the nation of Israel is implementing ‘Nazi’ activities regarding the Palestinians, then the German and European crimes are no longer so monstrous. Two types of service for the price of one: ‘Purification’ from guilt and old anti-Semitism. “Simultaneously the weight of a group possessing several million Muslim immigrants has grown in Europe, having become an electoral resource for local politicians. They dictate anti-Semitic and anti-Israeli politics to the parties of the Left, who are interested in their voices. My Comment: And yet, the Jews are guilty! Because everything that is happening in the world depends only on them! This is because only they have the freedom of choice to change the direction of human development. The Jews must understand and evaluate correctly what is happening; they are still able to change the development of the world from a direction that leads to world war to a direction that leads to a world that is good for everyone.